Studies pertaining to kinetic aspects of the direct electrochemical reduction process of titanium preparation from TiO2 have not been substantial for determining the conversion time precisely. The solid state reduction process does not permit measuring either the rate of formation of product or the rate of depletion of the feed stock. In this work an attempt has been made to study the applicability of variation of CO2 (the product gas) in the vent gases of the electrolytic cell to approximate the bulk process kinetics of the process. 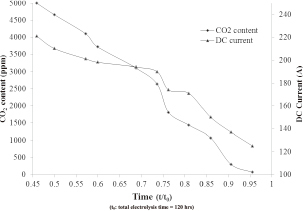 From the electrolysis current trend, it might be possible to estimate CO2 profile during the electrolysis time so as to utilize the same for inferring optimal time of the electrochemical reduction process.